To keep things super simple for this post... there are two types of control modules in our vehicles, UDS and non-UDS (legacy). UDS type modules were introduced around 2009 with some instrument clusters. As time went on, other modules went to the UDS protocol. With the 2015 Golf, all modules in it are UDS type. 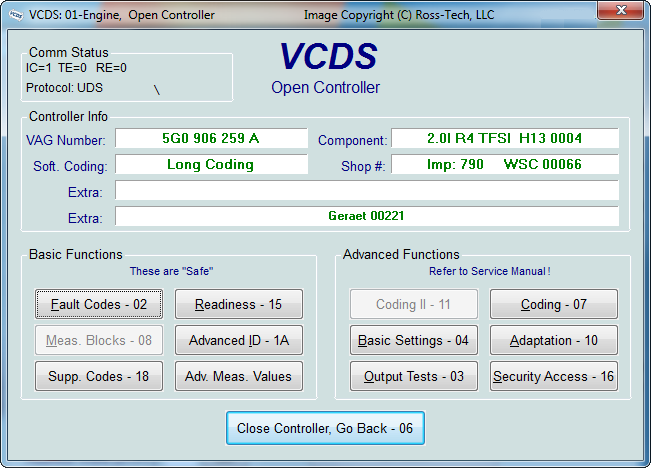 To identify if the module you are working with is UDS, on the Open Control screen, look at the Protocol which is in the upper left section. If the module is a UDS, then it will list UDS. If the module is a non-UDS (legacy) type module, then whatever protocol said module listed will be shown. With UDS modules, to view data, perform Basic Settings or Adaptations, you have to pick from a list. Notice that even [Meas. Blocks - 08] is no longer an option for UDS modules. This isn't because we, Ross-Tech, though that would be fun, but rather, this is what the Germans have done. Last edited by Jef; 10-05-2018 at 03:32 PM. UDS type modules were introduced around 2009 with some instrument clusters. Actually, in the NAR market, we first saw them in 01-Engine and 15-Airbags in the 2008 Audi A5. And you should see all the nonsense we have to go through to provide lists to pick from! This thread is intended to address frequent questions from customers about control modules that use the "new" UDS/ODX protocols. These first appeared circa 2008 in cars like the 8T/8K Audi A4/A5. Before UDS ("Unified Diagnostic Services"), Measuring Blocks used somewhat standardized numbers (like group 115 shows requested and actual boost pressure in many drive by wire gasoline engines) and fault codes had fairly consistent numbering. For example, in a 1993 Golf 2.0 ABA, if you got a fault 00532, VCDS would interpret that as "Supply Voltage B+: Signal too Low" or something like that. In a 2006 Audi A8L, the same fault would have the same meaning. The scan tool didn't need to know anything about the type of car in order to give you the fault code meaning. That all changed once UDS came along. My understanding is that the big European automakers, along with their suppliers, decided to get together on some common diagnostic "language" that would reduce differences for example, in what Bosch would need to do for control modules going into Volkswagens compared to the same type of modules going into Mercedes. In theory this could have resulted in our software being really useful (beyond just Generic OBD-2) on other brands, right? Wrong! What the ISO 15765 (UDS) did instead was to put in an extra layer of translation that was needed to interpret fault codes, measuring data, etc. So now when you get a fault code there is no way to know what it means unless you have a special translation file UNIQUE TO THAT SPECIFIC TYPE OF CONTROLLER. This is a colossal PITA for scan tool manufacturers like us since we need to maintain special files for every type of control module. If the ROD file is still missing and you see some message like ' No ASAM data for: "EV_ECM14TFS01104E997016B" (VW37) ' and you have made sure you are running the latest version, then please send us an AutoScan. On a related note, UDS modules still have label files as well, for things like Coding and Security Access. If you come across a control module that uses UDS but has no Label File, then again no PLA or PLB would help us to create one. Just send us an AutoScan instead. Can i ask if UDS channels in Advanced measuring blocks are the same for all UDS vehicles? E.g. will channel 002 always be Absolute Intake pressure (as reported in my vehicle)? Also is there a list of UDS channels and their corresponding descriptions avail or is there a way to print these in VCDS. Nope, the channel numbers vary wildly and there doesn't seem to even be as much consistency as there is with the older style, often inconsistent Measuring Blocks numbering. Really, the only way to know what is there, is to connect to the module and click on each channel to see what (if any) data is there. Frustrating, I know, when there are 700 or more channels to choose from. As of 15.7, VCDS has a "UDS Aggressive Mode" checkbox in the AutoScan screen (it has been in the Fault Codes screen for a while). 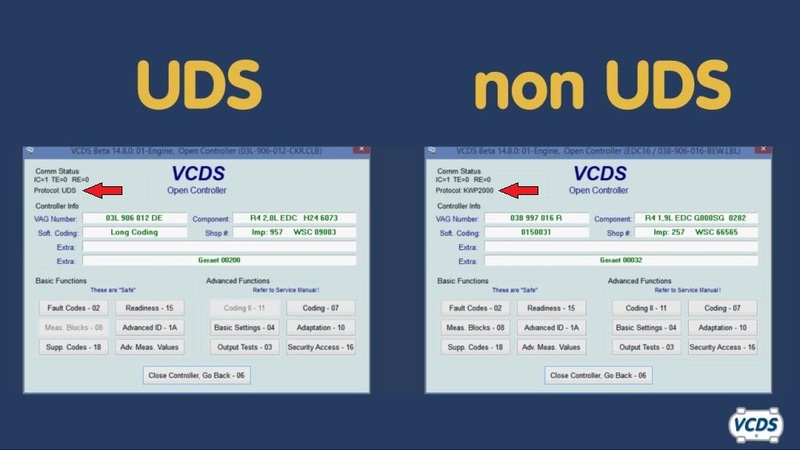 By default this is checked and VCDS will try to retrieve all fault codes, even ones that may not be shown by the factory scan tool, depending on which mode the factory technician is using. You can uncheck this box to more closely correlate your results with what would be seen by the factory scan tool in "Self Diagnostics" mode compared to their more aggressive checking in "Guided Fault Finding" mode. Is there a way to print out all the data channels available (Advanced meas. values) for a controller I am currently connected to, please? That would be useful sometimes when in battle with huge amount of unknown data fields... Just to let me know what is\is not available to watch. For this moment I do this "simply" by making printscreens of all tada channels. Sometimes 10 sheets of papers, omg . Last edited by hadez16; 03-08-2018 at 02:16 AM.